Hypoallergenic Earrings by Savvy Disco Designs – A collection of hypoallergenic handmade earrings for sensitive ears! Virginia Carlson of Savvy Disco Designs hand crafts each of her designs show here exclusively for Sensitively Yours. All of her handmade earrings start with either Sterling Silver earwires, or surgical steel earwires or posts. She then brings in semi-precious gemstones, vintage beads, lead-free pewter & silver plate beads, and more. Of course, all handmade in Fort Collins, Colorado. You can also check out her page at Facebook.com/SavvyDiscoDesigns. Keep in mind, Ginny’s designs exits in limited quantities of each earring. Every pair of her hypoallergenic handmade earrings for sensitive ears is unique. Therefore, some may vary slightly from those pictured due to the natural variations that occur in genuine stones and beads. Over the course of the year, as seasons change and holidays come and go, Savvy Disco Designs will introduce more and more designs. Ginny focuses on looks that reflect the beauty of the times. As you would expect, she goes to great lengths to procure findings, beads, and other gorgeous stones to include in her work. 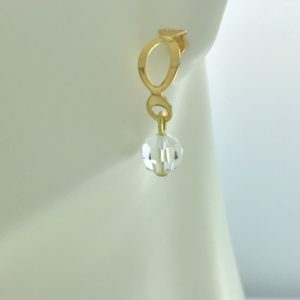 Known for delicate, dainty style, the Savvy Disco Designs handmade earrings are always a favorite. They stand out among earring connoisseurs who can appreciate the classy, well-spoken statement of the designs.